KJ (H.K.) Electronics Co., Limited is a specialized manufacturer for V-chip aluminum electrolytic capacitors. 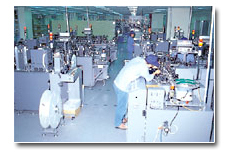 Over the years, with the idea of "creating benefits for the society ,gaining values for the customers ,providing opportunities for the employees,winning trust for the company",KJ has started a most complete production system in the V-chip aluminum electrolytic capacitors industry.It is now acknowledged by world top enterprises and companies for its product qualities,customer service and competitive power. 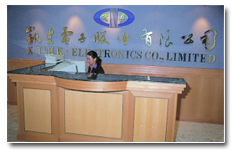 In 2010,KJ invested 100 million RMB to construct a modern factory in China,establishing Huizhou KJ Electronics Technology Co.Ltd and in August the same year,the HongKong Factory moved officially to the new venue in Huizhou China.Jieyang ZhongCui Electronics Technology Industrial Co.Ltd was purchased at 55 million RMB in 2011. To date,KJ has invested more than 200 millions,mainly on infrastructures,automatic production line,advance laboratories and technology research. KJ's factory, in Daya Bay Shihua Dadao West 45,Huizhou Guangdong,is well located and with complete supporting facilities.Operates on 3 shifts / 24 hours a day,it can reach annual production of billion. The main production equipment, Slitter Machine, Automatic Stitching / Winding Machine with Taping, Automatic Assembly Machine with Vacuum Impregnation, Automatic Aging / Sorting Machine, Automatic V-chip Base Assembly / Printing / Emboss Packing Machine, are manufactured in Japan. The supplementary equipment like Water Purification System and Air Compressor System are purchased from US and Germany respectively. The test and inspection instruments are from Japan and Germany, which include X-ray TV Camera, Spectrophotometer, Moisture Meter, Milli-ohm Hi Tester, Digital PH Meter, LCR Meter, Profile Projector, Low Temperature Chamber, Heating Chamber, Environmental Test Chamber, Ripple Power Supply and Reflow Soldering System. KJ was granted a patent license for the V-chip capacitor by Matsushita Electric Industrial Co., Ltd. on 25 June 2001, and renewed it on 25 July 2004 for the coming three years. Therefore, "KJ" brand V-chip capacitors could be sold in worldwide markets, and the second products if they incorporate "KJ" brand V-chip capacitor could be imported into Japan legally. KJ has maintained the systems certificates of ISO9001:2008, ISO14001:2004, OHSAS18001:2007 and IECQ HSPM QC080000 issued by SGS Hong Kong Limited, that well ensure KJ to improve its business operation and management systems continuously, and provide clients, employees, shareholders, regulators and the wider community with good quality, clean environment, safe and health workplace, hazardous substance free in its all products and related materials and processes for a long term. We are committed to create benefits for the society, add values for the customers, offer opportunities for the employees, so as to build trustworthiness for the company. We strive to achieve best practice and promote sustainable development through establishing, implementing and maintaining an effectively integrated management system in the place we operate. - to obey correlative laws and ordinances, take precautionary measures to minimize risks before they impact, and ensure all persons working for or on behalf of the company safety and healthy. We will follow the above principles throughout educating our employees, encouraging our vendors and improving our integrated management system continuously, in order to jointly achieve all of the goals.